First I used greenstuff and bits of wire to create the claws and used bits of spruce to create the ears. I then added these to the Revell Aztec clothed slinger. I next repositioned the right arm to make it pointing out. The arms from the shoulder to the glove i painted flesh as well as the bottom of the face. Then i gave it a basecoat of yellow. I painted the ears black and the shoulders, gloves, groin, and boots blue. 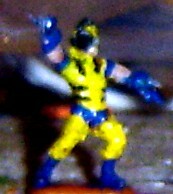 I then painted black stripes on the shoulders and sides and painted the claws silver.